The loading platform is in integral part of the process to guarantee stacking quality. Grouping and alignment of the bales on the loading platform is maintained by cone shaped drive rollers, guidance rail, magnetic sensor and the pusher bar. Once the bales are delivered to the trailer bed, adjustable side panels provide guidance for stability and further alignment. The specially designed, rotating rollers reduce material sticking to the trailer, attributing to a smooth and reliable operation. 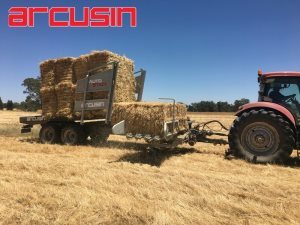 The bales are compressed between the loading platform & stacker tynes, meaning there is no need to tie down the load and bale strings are protected from the weather. The Auto Stack XP model is an excellent entry level to the auto stackers, equipped with floatation tyres offering low pressure and no compaction. The XP model also features a self-steering rear axle allowing for easier manoeuvrability. This unit is also available in three metre centres. The in cabin control monitor allows complete automation of the loading, transport & unloading cycle, it also allows the operator to control and manually operate each function. This reduces fatigue & operator error. There is currently multiple units working in Australian conditions, with constant research and development, demonstrations, technical support and spare parts from ACF in Australia and support from the Arcusin factory in Spain.